Chief executive Tim Weller leaves the beleaguered payday loan firm as chairman Andy Haste tightens his grip. It looks like Wonga has a serious case of executive butterfingers. Interim boss Tim Weller has stepped down after only five months, following the May departure of Niall Wass, who was there for an impressive six months, and the exits of co-founders Errol Damelin and Jonty Hurwitz in June and November last year respectively. Even the puppets packed their bags in July. The spate of departures is largely the result of the payday lender's money woes. In the summer it was fined £2.6m for sending fake legal letters to scare customers, before revealing a 53% drop in its 2013 profits in September. Writing off £220m of loans in October in an effort to improve its reputation can't have helped the bottom line, but will have improved its chances of warding off the Financial Conduct Authority (FCA), which has its eyes on the whole industry. Former finance chief Weller's appointment as interim boss was a nod to continuity with the fast-disappearing ancien régime till a new, more permanent chief executive could be found, but it appears chairman Andy Haste may have lost patience. Haste did thank Weller for his three years of service as finance chief (though not, interestingly, as interim chief executive...), but it's hardly gushing, is it? The fact that Wonga only 'announced' the departure yesterday - which actually took place in October - because it had to file with Companies House, is a sign that perhaps it really doesn't want to talk about it. 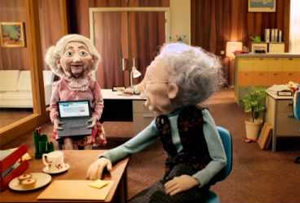 How long it will take Wonga to find a new chief executive is unclear. Maybe someone could loan it one to tide it over while it waits.